Media outlets and websites circulated footage of a billboard in one of Baghdad’s streets that displayed the Palestinian flag during the Monarch’s official visit to Iraq yesterday. They claimed the Palestinian, not the Jordanian flag, was in place during the reception of His Majesty King Abdullah II, a claim refuted by Jordan Media Credibility Monitor “Akeed”. 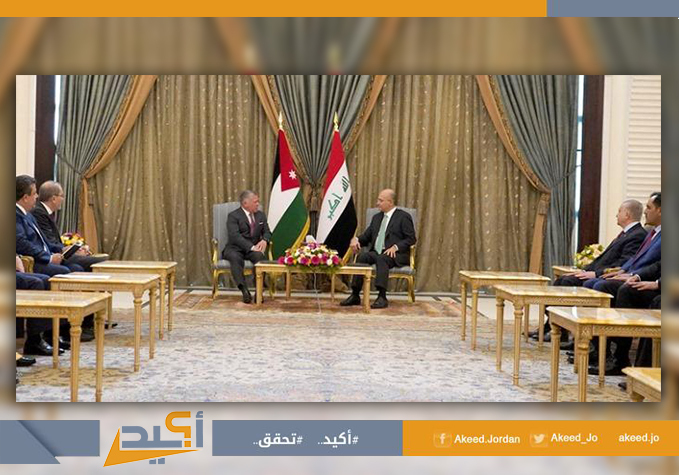 Akeed, which played back the live broadcast of the event as well as the live coverage of the Iraqi News Agency, verified that the Jordanian flag was flown during the King’s official reception. It also found that the Palestinian flag was only displayed on a billboard in one of the capital’s streets. It is worth noting that the official Iraqi media did not pay much attention to the incident, which was reported by some Iraqi websites. Akeed also checked footage broadcast by Agence France-Presse (AFP) during the reception, shared by Jordanian media outlets, that showed the Jordanian flag flown during the visit. Added to that, videos and photos reviewed by Akeed showed Baghdad Mall lit up at night in the colors of the Jordanian flag. Although an Arabic news channel broadcast footage from the official reception which showed the Jordanian flags flapping, they later retracted and circulated the same false news. Akeed found that over 19 Arabic websites have circulated the incorrect news, in addition to several social media platforms, primarily “Facebook”. But it is not the first time that such an issue – involving the Jordanian flag in official visits - causes a stir in mainstream media outlets and across social media platforms. Just a few months ago several reports were circulated saying “the Jordanian flag was placed upside-down” during a meeting between Jordan’s Minister for Foreign Affairs and Expatriates with his Turkish counterpart. The reports were proved to be right prompting an apology from Ankara.